Thank you for your interest in becoming a Candidate member of the National Ski Patrol and part of the Lost Trail Ski Patrol family. If you are interested in the Candidate Class for 2016 / 2017, the Lost Trail Ski Patrol will be having a meet and greet and ski day for potential new patrollers on Sat. March 19th at 9:30am. For more information click on the Join the Ski Patrol link above. O.E.C. training will start in the fall, and will meet every week for review and practical application of the assigned study material. Once the area is open Candidate training will expand to include on hill training and practical O.E.C training, Toboggan and ski / snowboard skills and Area operations, this training will be scheduled for Saturdays. To be a successful candidate you should plan to commit approximate 80 hr of study time and complete as many on hill days as possible (12 duty days are required by NSP) the more time on the mountain, the better. Cost for this years class is $300.00 this fee covers your membership dues to the National Ski Patrol, dues to the Northern Division of the NSP, all course materials and manuals. CPR (Health Care Provider) certification is required and a separate cost. As a Candidate member of the Lost Trail Ski Patrol you will be provided with a Candidate vest to wear when on the hill identifying you as a member of the patrol and acting as your lift ticket for the season. Upon successful completion of your candidate year, and being invited back as a Basic Alpine Patroller members of the Lost Trail Ski Patrol are entitled to receive a family season pass, discounted lunch (for duty days) discounted pricing on ski and snow board equipment through Pro Form pricing from equipment manufacturers and access to full membership benefits of the National Ski Patrol . 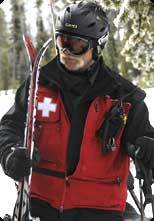 We look forward to talking further with you about becoming part of the Ski Patrol family at Lost Trail Powder Mountain.